Crumbs and Cookies: best cocoa brownies (with sautéed bananas). 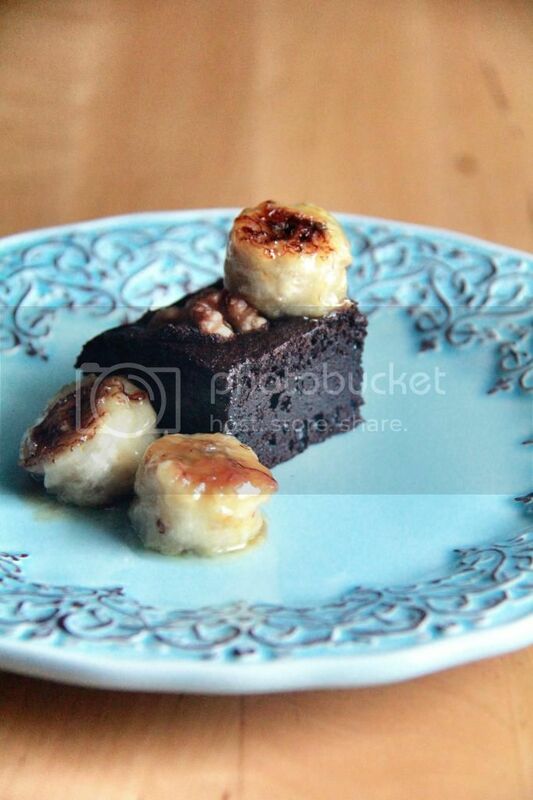 best cocoa brownies (with sautéed bananas). Hey all! Just casually popping by to breathe some life back into this dusty space before it turns into a tangle of cobwebs. My creative juices have not really been churning lately so I've been revisiting a couple of old favorites, like these cocoa brownies like Alice Medrich. I blogged about them a few times before but did not quite give them the full attention they deserve so today I shall finally do them justice. These brownies are probably still one of the best brownies I've ever tasted - intensely chocolaty (although I would cut down on the sugar a bit) and fudgy (try them when they're cold through!). Plus they are a breeze to whip up; this recipe requires really the most basic of brownie ingredients. If the crackly top is a major deal breaker in your book, this recipe does yield brownies of that nature if you whisk the batter a bit longer (I forgot to this time). I imagine it must be air bubbles in the batter that contributes to the crinkly magic. Aaaand I had to saute some bananas to have with the brownies. Lip-smacking. Preheat oven to 325F. Prepare an 8 x 8 inch baking pan. Combine the butter, sugar, unsweetened cocoa powder and salt in a medium heatproof bowl and set the bowl over a pot of simmering water. Stir from time to time until the butter has melted and mixture is smooth. Remove from heat and stir in vanilla. Beat in eggs one at a time, incorporating the first fully before adding the second, until the batter looks thick, shiny and well blended. Add the flour and stir until all traces of it disappear. Pour batter into prepared pan and bake for 20 to 25 minutes, or until an inserted skewer comes out with moist crumbs attached. Cool completely before slicing. Placing them in the fridge until they're completely cold would make slicing easier. Yum! 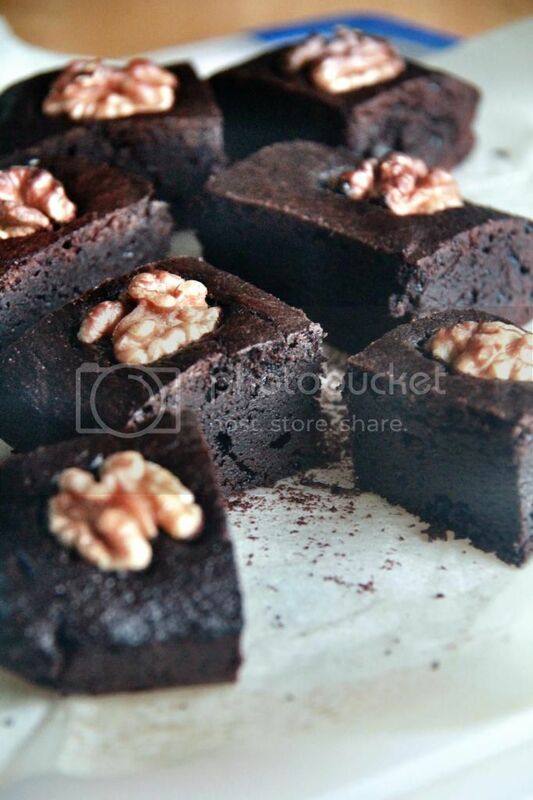 I love chocolate brownies - and these look like an absolute winner! Thanks for sharing the recipe! This sounds awesome!!! I love the sautéed bananas - classy touch! Chocolate and bananas are always great together!! Sounds special and classy. 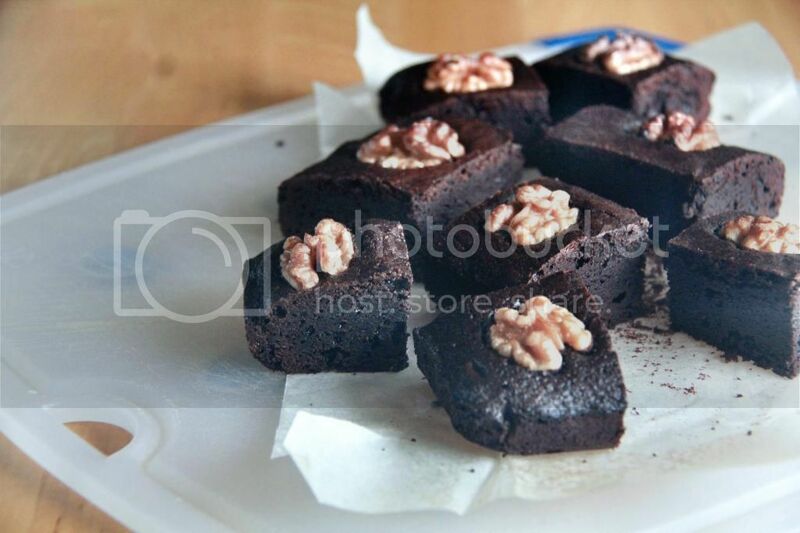 I love it, I'm starting to crave for, these brownies:). Thank you for sharing. banana cake with peanut butter frosting.